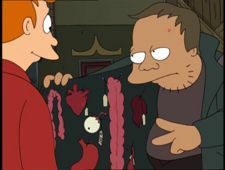 Yuri (Russian: Юри, Juri) is an organ dealer who operates an illegal alleyway surgery where he transplants various organs, such as Z-ray eyes, gills and lungs. His accent appears to be of Russian heritage. He also has a companion Nurse, whom is a large man, presumably also Russian of heritage. He is a reference to Cornelius Evazan from Star Wars Episode IV: A New Hope. Yuri: Z is just as good. In fact, is better. Is two more than X. This page was last edited on 14 September 2017, at 23:55.